Hello! My name is Jonathan Knott, and I have been teaching guitar for six years to students from young beginners to experienced adults. I received my BA of Music in Jazz Studies from the University of South Carolina where I kept a busy performance schedule playing in numerous student concerts and events, many of which were held in the Kroger Center for the Performing Arts. A few special opportunities I’ve had to perform were at the 2015 Jazz Educators Network (JEN) in San Diego, California and at the Trustus Theater. 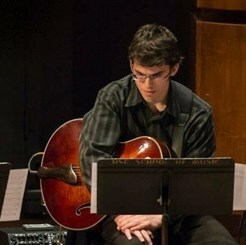 I also regularly play guitar and percussion at my church, Ebenezer Lutheran, and keep busy with both jazz and rock gigs. I believe the mark of a good teacher is being able to learn as much from the student as they learn from me. Every student is a unique individual and has their own style of learning music, and I always strive to incorporate their special musical interests and learning styles into the lessons.